3D Laser scanning is the fastest, most accurate, and semi-automated method employed today to acquire 3D digital data for reverse engineering and retrofit/modification to as-built assets. By the use of specialized software, the point cloud data is used to create a 3D CAD model of the assets geometry or by using the point cloud directly one can optimize modifications/retrofit; fast, efficient and accurate. The process can be visualized through web portal interfaces, enabling discussions across geographical continents, thereby easing the process of design approvals. The CAD design model can then be drawn up in Isometric 2D drawings and handed over to pre-fabrication workshops for accurate system fabrication, eliminating excess MTO’s and simplifying installation processes. There are few limitations to 3D Laser Scanning and it can be applied to almost any asset or part thereof. A Point Cloud carries an accuracy of +/- 3-6mm and this is normally within the required range for design and fabrication. For more accurate data collection we use Electronic Surveys to create an even stronger internal accuracy and can achieve +/- 1,5 mm accuracy. 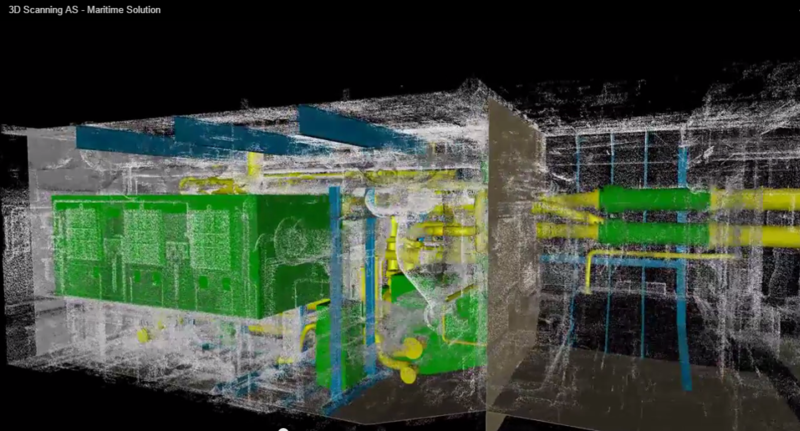 An advanced 3D laser scanning service for mass capture of existing facilities. The data can be directly interfaced with all CAD platforms including AutoCAD, Micro-station, PDS and PDMS to allow clash verification between as-built scan data and new design. Our system can capture over 1 million points per second and can scan through 360° horizontally and vertically over a range of 0,5 - 50,00 metres to create a 3D point cloud data base of the scanned area/asset in question. HSEQ and 3rd party requirements to be distributed through the Management system.